SHANGHAI / DALIAN - After losing her sight at the age of 20, Wang Xiaojun never thought her decades in the dark would allow another person to see. Yet it was her experience with blindness that led her daughter to envision a career as a guide dog trainer. "It was because of my mother," said Wang Xin, who years later realized how much her mother's life improved after getting a guide dog. "She has never seen what I look like and I figured if there's anything I could do to improve the lives of those with visual impairment, I'd love to give it a try." After three months of probation she became a full-time guide dog trainer in the country's only guide dog training center at Dalian Medical University. "I knew exactly how it worked since I witnessed the change after Beibei joined our family," she continued. "When a dog is not regarded as a pet but a partner in life, everything changes - not only my mother's life but also our family's daily life." Wang Xiaojun lost her sight 36 years ago during an earthquake when she was knocked into a tree and detached her retinas. 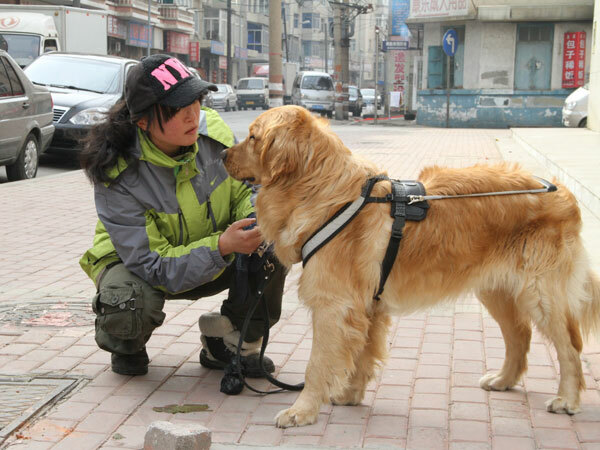 Two years ago a guide dog named Beibei, a 4-year-old light golden retriever, moved into her home in Dalian. Beibei helps her navigate crowds, pick up dropped items or open and close doors. Anyone who has ever loved - and been loved back by - a dog knows how strong the bond can be. For a blind person living with and depending on a guide dog 24 hours a day, that bond is almost indescribable. Before returning to Dalian, Wang Xin, 31, spent nine years studying and working in Japan. "If I was only working for money I'd stay in Japan. I can easily earn more than 10,000 yuan ($1,500) per month by doing a part-time job. But I told myself, since I'm back I'm going to find a job that I love," she said. When Wang's mother heard of her decision to quit a better-paying job to become a dog trainer, she hesitated offering her support. "She spent over seven years getting a bachelor's degree and master's degree in psychology but now wanted to start all over again at the age of 30 to become a dog trainer?" The daughter is currently training two golden retrievers, both of which were donated to the center. To teach 13-month-old Hehe how to orient itself in a crowd, Wang takes it for a walk along downtown streets in Lushunkou district of Dalian for about an hour every day. Hehe is curious about everything and may stop to sniff at a dustbin or play with other puppies. Wang has to keep telling it patiently to "go, find the way, stop sniffing". When Hehe does something right, Wang caresses its head; when it does something wrong, she pulls the leash to warn it; when they come across an obstacle, Wang pretends to not see it and stumbles. She then asks Hehe to guide her again. "Reward and repetition are two of the most important elements about dog training," she said. "But during training of a guide dog, we can't reward them with food - imagine a guide dog leading a blind man through a lane full of street food? Without training, the dog would jump at the food." Puppies bred to become guide dogs at the center go through rigorous testing for seven weeks to determine if they have the temperament to become guide dogs. Only 30 percent of the dogs trained at the center end up becoming guide dogs, said Wang. The strict training process starts at 12 months for Labradors and 14 months for golden retrievers (two most frequently used guide dogs) and continues for six to 12 months, depending on how quickly the dog learns. "These dogs are trained for the blind and visually impaired, and because I'm living with one, I know what's best for them," she said. "For example, many of Dalian's stairs are not equal in height for each step. Usually a guide dog is trained to stop and wait when it reaches the top or bottom of a set of stairs, but I'm trying to teach my dog to stop and wait for a second at each step." Another benefit Wang hadn't expected would help her new job was her background in psychology. "I hadn't realized there was animal psychology until I read about it," said Wang. "Like human beings, every dog has a different character and you need to use different methods to train them ." According to Wang, about 15 dogs can be trained at the center every year - yet the country has 6 to 7 million blind people. "The figure is rather limited compared to the big population of the blind across China," said Wang. "But it costs around 120,000 yuan to train one guide dog and our training center is run by donation - if only we could help more people."